As more business technology infrastructure moves online, so does the potential for exposure to cyber threats. Cybercrime is a great concern to most companies. Mobile computing and an expected 46 trillion connected devices in use by 2021 translates into more demand for effective security solutions. According to the latest worldwide market study by Juniper Research, while the growing enterprise spend on cybersecurity is increasing rapidly, it's apparently not keeping pace with the corporate liabilities caused by potential data breaches. 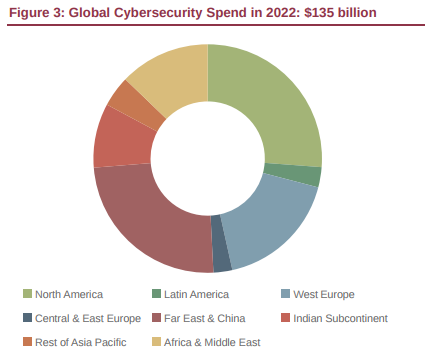 Their latest study findings have resulted in a forecast that global IT security revenue will reach nearly $135 billion in 2022 -- that's up from an estimated $93 billion in 2017. However, over the next five years, corporate data breaches will likely have cost organizations a cumulative total of $8 trillion in fines, lost business and associated remediation costs. The research also found that businesses are now faced with a plethora of different cybersecurity solutions to choose from today. Many of which don’t integrate well with each other, and they also require a high-level of experienced technical expertise to manage. This means that threats can be missed, and small businesses -- which are now very likely to be targeted by cybercriminals -- are the least able to effectively manage their online security needs. To deal with this increasing complexity, several cybersecurity firms are using cognitive systems with machine learning to monitor network and computer program behaviors, thereby detecting and eliminating many anomalies without involving an IT professional. This can alleviate the skills gap that small businesses face when considering appropriate security measures. Juniper Research expects Managed Security Service Providers (MSSPs) to leverage Artificial Intelligence (AI) technologies to provide more affordable services to these businesses, making the best of limited security budgets, and providing a mechanism to make the industry consolidate. "AI provides a solution for the cyber security market's talent gap, performing similar roles to human experts," said James Moar, senior analyst at Juniper Research. "However, in order to succeed these new approaches must also bring simplicity and interoperability to end users, in what is a very fragmented market."